Na'imah Muhammad and Nedjma Kalliney discuss their writings in a session of the "Giggles, Guts, and Glitter" creativity workshop. Photo courtesy of Anna K. Stone. 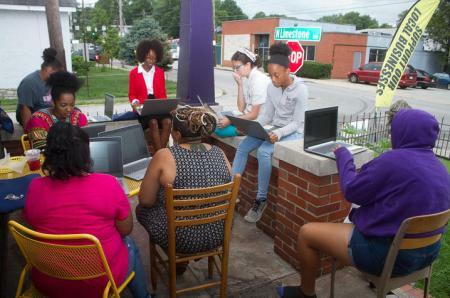 DaMaris B. Hill, an assistant professor of creative writing and English literature in the University of Kentucky College of Arts and Sciences, recently hosted a writing and creativity workshop for young women of color. The workshop was made possible by a "Girls of Color: Voice and Vision" grant from the Kentucky Foundation for Women. The purpose of the project was to elevate the voices and lived experiences of these young women by sharing personal stories and creating art. "A project that educates black girls about accessing voice, feminist arts and social justice is necessary," Hill said. "This type of project prepares black girls to use their voices, to articulate their needs in an America that is increasingly pressuring them to negotiate national identity in the context of a racist political climate. In kind, the work honors the legacy of black feminist artists that have engaged in social justice efforts in America." 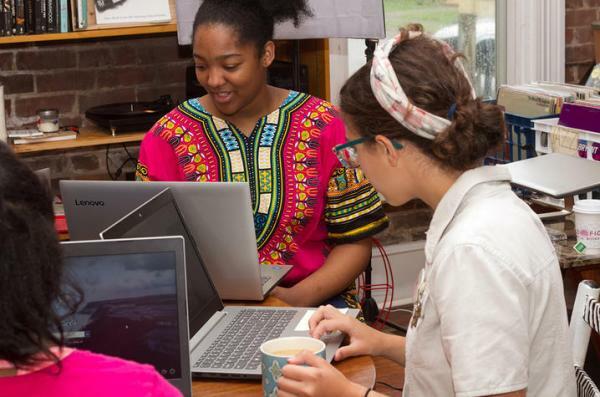 The workshop, titled "Glitter, Guts, and Giggles," was led by Hill, who encouraged the young women to use their voices in a 21st century context across digital platforms, including writing, image and music. Participants read and discussed writing from black feminist artists and social justice practitioners, including Kentucky's bell hooks, Nikky Finney, Crystal Wilkinson and others. “'Glitter, Guts, and Giggles' not only taught me about writing as a way of self-expression, but a method self-expression," said Zoe Jenkins, one of the workshop participants. Hill hopes the work these young women created will be a catalyst for social change in their individual lives, Kentucky and beyond. The girls' work will be on display at a public reception 6-7 p.m. Tuesday, Aug. 7, at the Carnegie Center for Literacy and Learning in Lexington.